I don't really ever get tired of it. Well I do, but it takes a long time and meanwhile everyone else is probably hoping I'll forget the recipe. It really is the best soup for rainy days, and no child would ever guess that there was a lentil in it. I lie and say it's tomato soup, just like out of a tin. I'm practicing illustrating recipes at the moment. 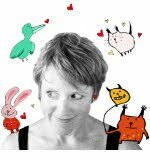 Have a look at this site - They Draw & Cook (Recipe Renditions by Artists, Illustrators & Designers). Soup again tonight! It is officially the first day of winter, after all. 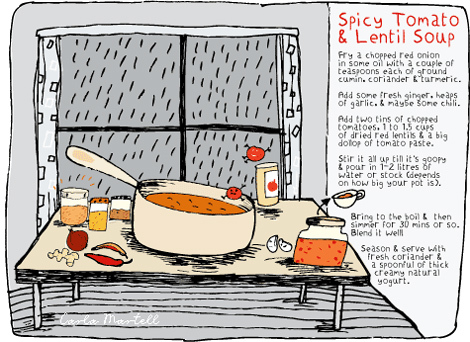 What a fab illustration and the recipe sounds delicious, I may try it on my lentil hating boys!